You may contact us by filling out the feed back form below or using our livechat. For convenience, you can provide your phone contact and we’ll get in touch with you. Address: Equatorial Fidelity Centre, 5th Floor, Waridi Lane, Off Waiyaki Way, Westlands. P.O.Box 47435, 00100 Nairobi, GPO Kenya. 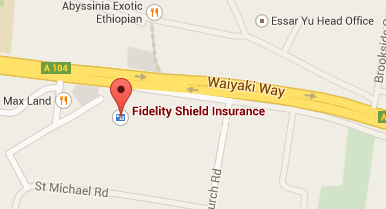 Address: Fidelity Shield Insurance House, Kaunda Street. P O Box 90103-80100 Mombasa. Address: Zion Mall, 1st Floor, Uganda Road. P O Box 7877-30100 Eldoret. Address: Kenya-Re Plaza(Wedco Centre), Shop Unit 2 Block B, Oginga Odinga Street. P O Box 2243-40100 Kisumu. Address: West Side Mall, 3rd Floor, Kenyatta lane. P. O Box 18622-20100 Nakuru. Address: Transnational Plaza,8th Floor, Mama Ngina Street. Address: Along Kwame Nkrumah Street.